daily or annual fee. 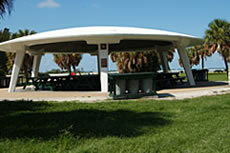 A fee is not collected from persons entering the park on foot or by bicycle. The largest park within the Pinellas County Park System, Fort De Soto park consists of 1,136 acres made up of five interconnected islands (keys). These keys are home to beach plants, mangroves, wetlands, palm hammocks, hardwoods and scores of native plants. Each of these species plays a vital role in the preservation and protection of the natural environment. Another amazing example of the importance of the park's natural ecosystems is the more than 328 species of birds that have been documented over 60 years by ornithologists. New species are being added every year. 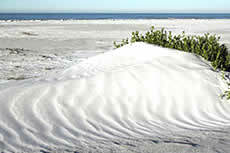 The beach also provides refuge to the loggerhead sea turtle, which nests between April and September. 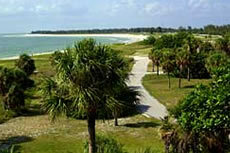 Fort De Soto was named America’s Top Beach for 2009 by Trip Advisor, the world's largest online travel community. In 2005, “Dr. Beach,” named Fort De Soto the nation’s #1 Beach. Annual park attendance averages more than 2.7 million visitors. 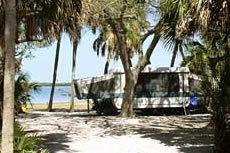 Over 7 miles of waterfront, includes almost three miles of beautiful white sandy beach. 800-foot-long boat launching facility with eleven floating docks. Multipurpose trail - seven miles of paved trail connecting North Beach, East Beach, the boat ramp and the camping area. No motorized vehicles allowed. Two large swim centers including a food concession area located at the North Beach Swim Center. Two fishing piers - each pier has a food and bait concession - Gulf & Bay Pier Hours: 7 a.m. - 11 p.m.
6.8 mile, 12-foot-wide asphalt recreation trail connects the campground with the North and East Beach Swim Centers and the historic fort. 1-mile nature trail in the Arrowhead Picnic area, and a 3/4 mile nature trail in the Soldiers' Hole area provides a glimpse of some the native fauna and flora. 2,200 foot Barrier-Free Nature Trail is a self-guided interpretive trail providing access to nature for all visitors to Fort De Soto Park, regardless of their physical abilities. Dog park - Please review dog park rules. Fort De Soto has the only dog park where dogs are allowed on the beach in a designated area. There are also 2 fenced-in areas near the beach for large and small dogs with water stations (beach entrance is at the far southwest corner of dog park). Road Closures: Roads will be open by 9 a.m. The park property was first purchased from the federal government in 1938 for $12,500. In 1941 the property was sold back to the federal government for $18,404 to be used as a gunnery and bombing range during World War II. The property was repurchased from the United States in 1948 for $26,500. The 12-inch mortar battery, located at the fort for which the park was named, was listed in the National Register of Historic Places in 1977. Adding to the historical interest at Fort De Soto, two British breech-loading, rapid-fire rifles of 1890 vintage were installed in March 1982. Markers showing the original building locations and a Quartermaster Storehouse Museum add to the park's historic interest.